Keith Hann - Why Oh Why? : Is 'I hate politicians' the right way to vote? People really hate politicians, don’t they? Not just the Tories, always major hate figures in my neck of the woods, but politicians in general. The Conservatives for heartlessness, Labour for past economic incompetence, the LibDems for broken promises and all for hypocrisy and bloated expenses. Yet amidst all this Nigel Farage somehow manages to shrug off a veritable tsumani of gaffes and extremist outbursts from his candidates that would have done for any mainstream party leader long ago. Because people don’t see him as a serious politician, but an affable bloke with whom they would enjoy a chinwag in the pub. And, if they are at all right wing in their inclinations, agree that he talks an awful lot of common sense. Particularly about those issues that every other party deems too politically incorrect to discuss; notably immigration, on which many traditional Labour voters harbour convictions every bit as “right wing” as their Tory counterparts. 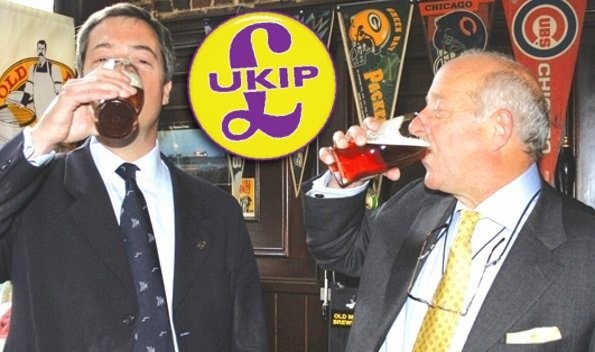 I have considerable sympathy with Mr Farage’s view of the EU and I’d certainly rather spend an hour or two in a boozer with him than with Messrs Cameron, Miliband or Clegg. But how many other UKIP MEPs or candidates have you ever heard of? Probably just that bloke who jumped before he was pushed for jokingly calling party activists “sluts”, though I’ll wager you can’t remember his name. How many UKIP policies can you list, for that matter? I’ve just taken a look at their website, and am not massively wiser. I was surprised when a fellow lifelong Tory told me the other day that he will be voting UKIP in the European elections specifically as a protest against the Conservatives’ espousal of gay marriage. No doubt there will be a similar range of motivations behind those who will grant UKIP a historic victory on 22 May, if the current polls are to be believed. But underlying it all will surely be simple loathing of professional politicians, allied with the certain knowledge that Mr Farage will not be moving into Downing Street as Prime Minister. Meanwhile the smooth and quintessential professional currently occupying that role faces his own potential day of reckoning in September, when Scotland goes to the polls in the referendum that he granted on the assumption that the result would be a resounding “no”. Survival of the Union still looks the way to bet, but only just. Because such is the hatred of mainstream British politicians that their every intervention pointing out the folly of voting for independence just seems to push a few more waverers into the “yes” camp. In this respect, Alex Salmond may be characterised as McFarage Lite (or, more accurately, Heavy). There must be considerable doubt as to whether Mr Cameron could survive as Prime Minister if the United Kingdom broke up on his watch. And then what? 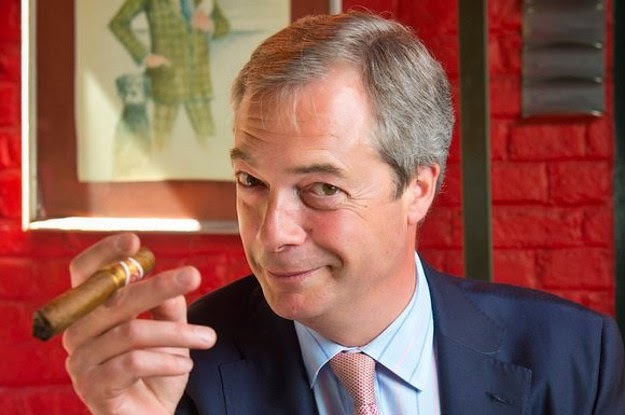 There is only one potential Tory leader who can match the Teflon qualities of Nigel Farage. Another man equally at home on a TV game show and apparently able to shrug off all manner of revelations about his personal life. People don’t even seem to hold the fact that Boris Johnson went to Eton against him, because he is a laugh. 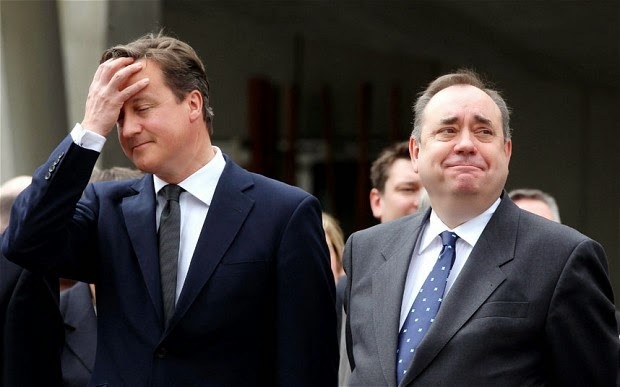 Even if you rate Labour’s chances of victory in the General Election scheduled for May 2015, their prospects of staying in government cannot look good if their 40-odd Scottish MPs are booted out of Westminster. 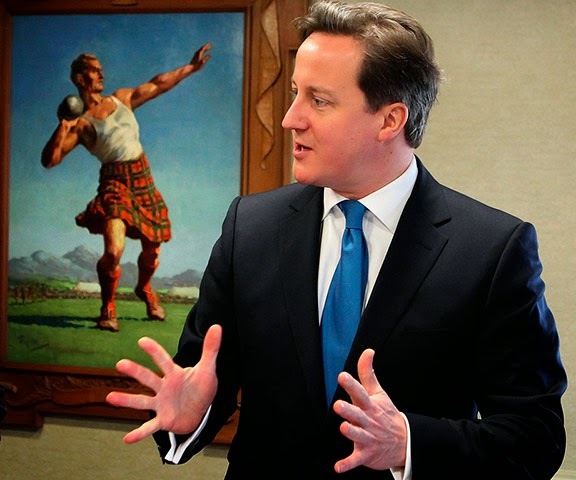 Particularly if, by then, the Tories are led by charismatic career politician successfully masquerading as a buffoon. I keep reading that this is the age of tactical voting. Tactical voting for UKIP on 22 May will tell the major parties that we hate them all, but won’t get us one inch closer to exiting the EU. Scots voting for independence in September may do for Mr Cameron in the short term, but will ultimately be far more of a disaster for Labour. These are certainly very exciting times for anyone with an interest in British politics. The sad thing is that many of us only seem interested in giving all the main parties a kicking. Perhaps we should all pause to reflect on the likely consequences before we do so?